You’ve waited at your passenger’s pickup location for five minutes. You now have the ability to cancel the ride and collect the cancellation fee. Lyft makes that decision a little bit easier for you by allowing you to see your passenger’s destination ahead of time. Today, Joe with The Rideshare Guy is going to talk about how you can use that information ethically and to your advantage. Take a look at Joe’s video to see how to see a Lyft passenger’s destination ahead of time, then check out the video transcript below to see the points he covers. As soon as you arrive at your Lyft passenger’s pickup location and tap that you’ve arrived you’re able to actually zoom out and see where your passenger’s destination is, and you can use this information to your advantage, as with the example in the beginning where I’ve waited the entire five minutes and I now have the ability to cancel the ride. A lot of the times I will just cancel those rides and collect the cancellation fee, but sometimes if that destination will bring me closer to say my home, or it’s a good ride, I’ll wait an additional few minutes, or I’ll contact the passenger because that is now a more desirable ride to me because I know the destination. Other times, and I personally won’t do this very often, but if it’s an undesirable ride, if I arrive and I see the destination and it’s just an undesirable ride, it’s a ride that takes me 15 minutes out of my way, or it’s just not a ride that I want to have, I will actually cancel that ride in certain circumstances. It’s not a great experience for passengers but as drivers I feel like it’s our prerogative. We can pick and choose rides sometimes. The main caveat being like with Lyft, I keep a 90% acceptance rating, so I don’t fall below the 90% acceptance, so I find that it’s okay, I can justify canceling some of those rides since I don’t do it very often. And again you want to use that information ethically. It’s nice of Lyft to allow us to see that destination ahead of time and we can use that to our advantage, but we want to do it ethically. We don’t want to be canceling rides all the time. If you’re getting rides that you just don’t want, short rides, and canceling, that’s just not the way to use the feature, in my opinion. Related: Can Uber drivers cancel based on the passenger’s destination? You want to keep your acceptance rate above 90%, and I feel as long as you’re keeping your acceptance rate above 90% you should be able to cancel those rides occasionally, especially the ones where you’ve waited the entire five minutes. It makes that decision much easier. So, how do you actually see your passenger’s destination ahead of time? When you arrive at your passenger’s pickup location you’ll tap to arrive, confirm arrival, and then you can basically pinch to zoom out on the map, and when you’ve zoomed out to a certain point you can then see your passenger’s destination. And again, you’re able to do this immediately after you’ve tapped to arrive and before you’ve actually started the ride. You’ll tap to arrive. Confirm arrival. Zoom out. Pinch out on the map, and at a certain point you can see the destination. It’s really cool of Lyft to have this feature and allow us to see the destination ahead of time (I wish Uber would copy this feature). You could use that information to your advantage. You want to use it ethically. You want to keep your acceptance rating above 90%. You don’t want to just be consistently canceling rides because you don’t want the ride, it’s a short ride, or it’s just a ride that you don’t want. That short ride may lead to a longer ride. You want to accept the majority of rides, but in some instances there may be rides that you want to cancel. Rides where you’ve waited the five minutes and you want to collect the cancellation fee, or rides during times, peak times, long rides, that you just don’t want. I feel as long as you keep that acceptance rating at 90% or higher you can cancel certain rides. 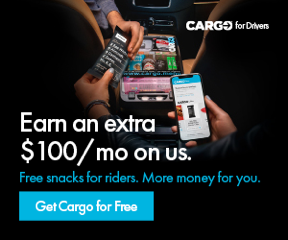 Can Someone Else Ride With Me While Driving For Uber?